Earn $0.39 in Rewards credit (39 points) What's This? Sometimes it's the small upgrades that make the biggest difference. Jagwire's premium Slick Stainless Brake cables help reduce friction and keep your bike stopping smoothly. Each cable comes pre-stretched, minimizing the need for adjustments after installation, and they're double-ended for use with road or mountain levers. 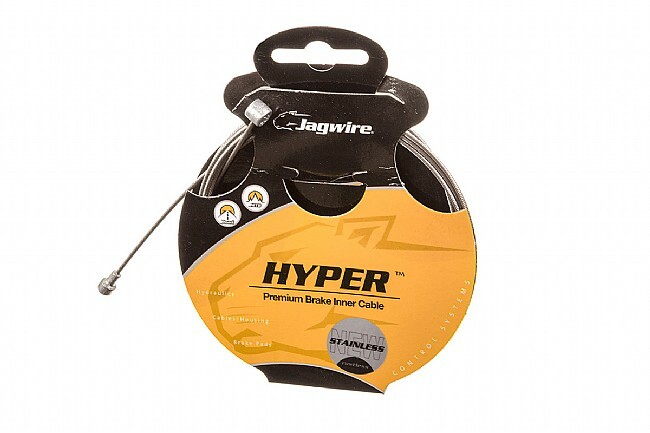 The Jagwire Slick Stainless Brake cable is sold individually. This version features Shimano/SRAM-type road/MTB ends. Each cable is 1700mm long. Standard 1.5mm diameter. Not compatible with Campagnolo brake levers. I always like to have an extra cable or two around, and this works well. Cables! They work! Make your bike shift! I've been using Jagwire Slick Stainless cables for years. I've used sexier (and pricier)PTFE-coated cables (Teflon is one brand name for PTFE) and those cables do perform marginally better. But the Jagwire cables cost a lot less, have provided the same quality on every cable I've bought, hold up well under harsh riding conditions, and I've yet to break one. but you should do yourself a favor and just buy a whole set (brake and shifting).